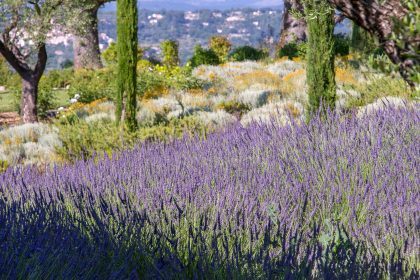 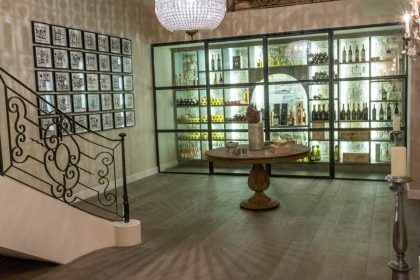 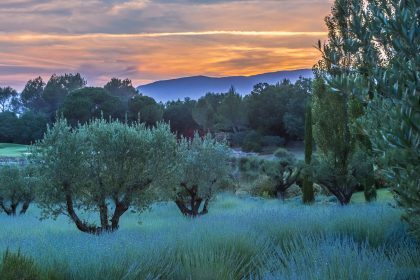 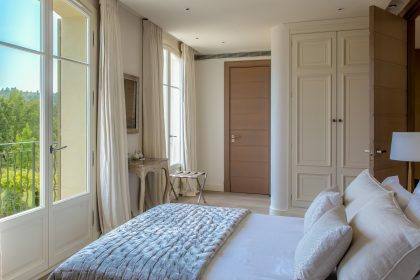 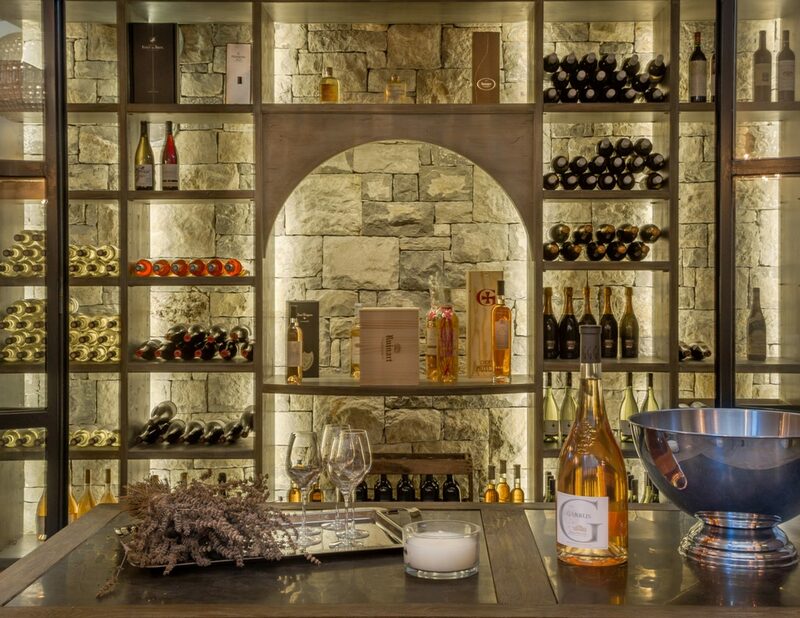 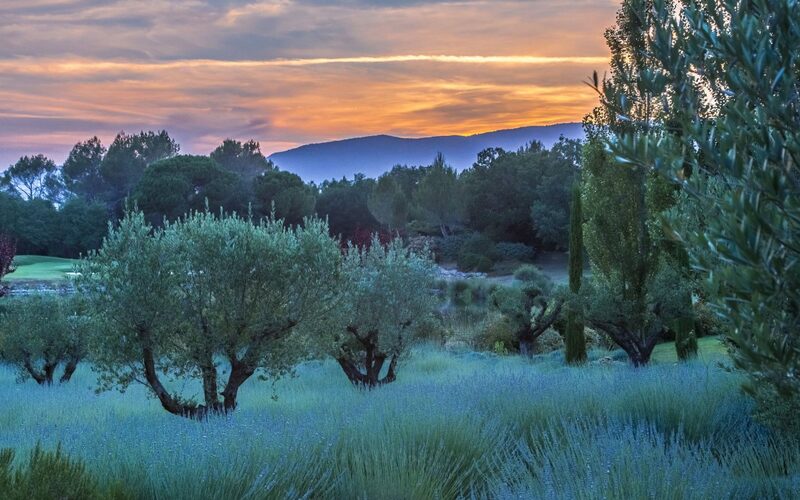 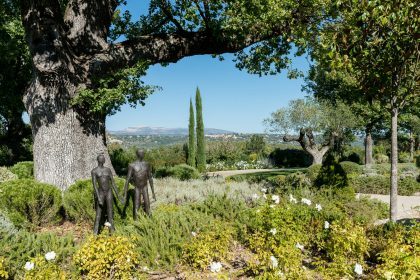 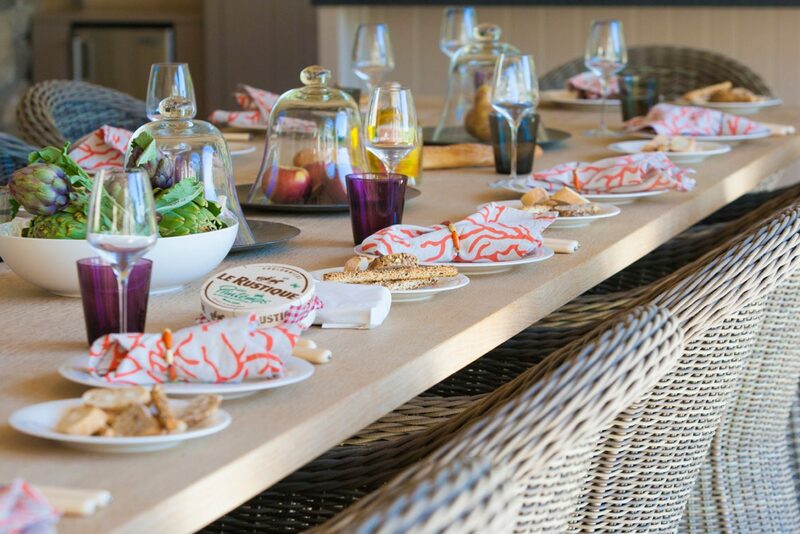 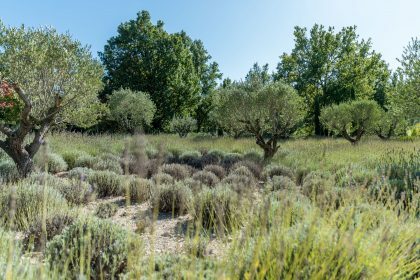 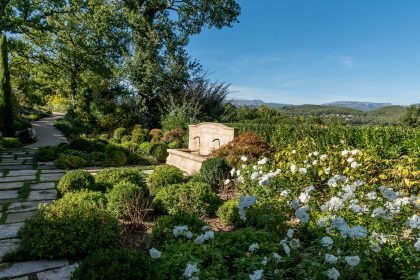 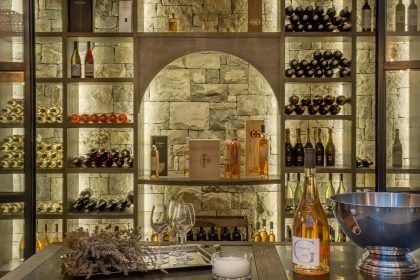 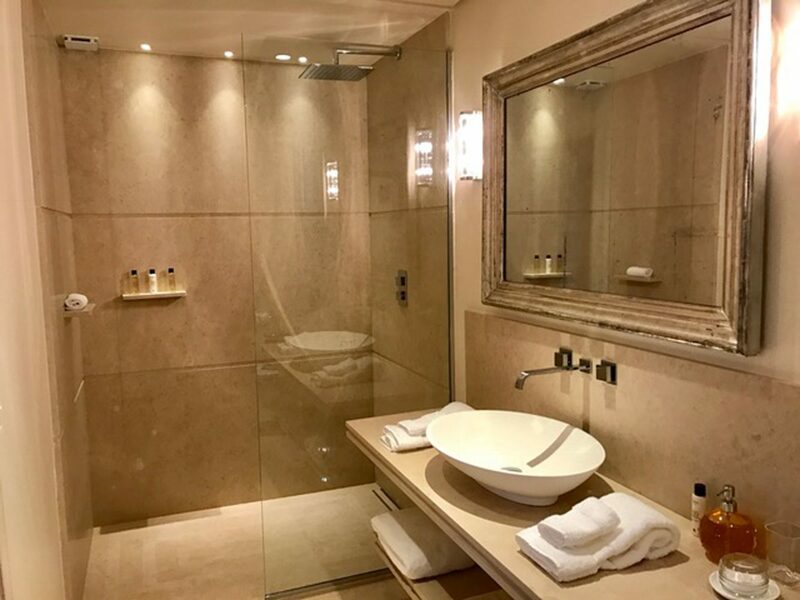 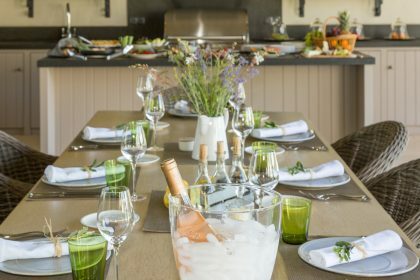 There is so much to do in this area – from spending the day at the beach or in Cannes to visiting one of the local vineyards (the staff at the house can arrange everything for you). 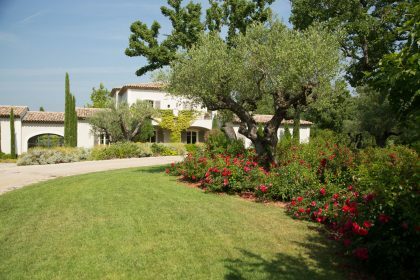 The local villages are known locally as the “Villages Perches” such as Fayence, Seillans or Caillan. 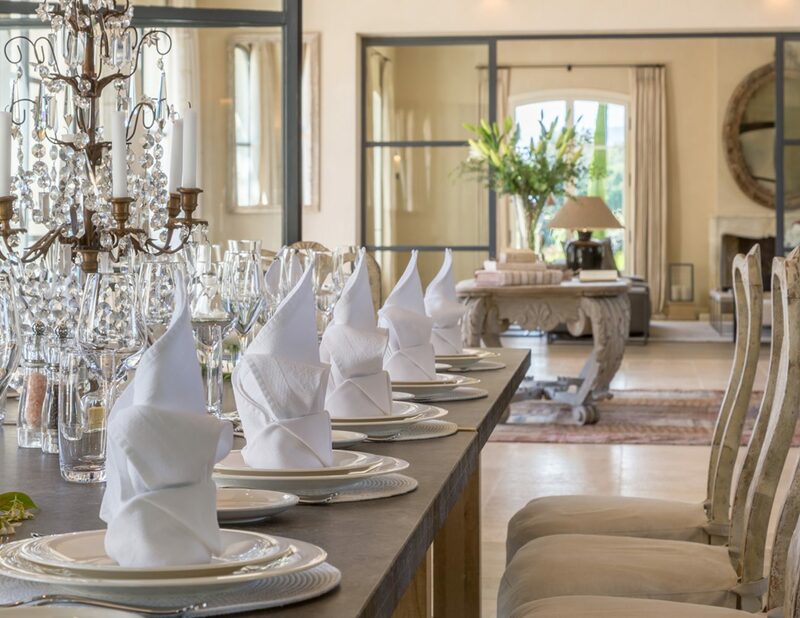 All have wonderful food markets and a fabulous choice of restaurant. 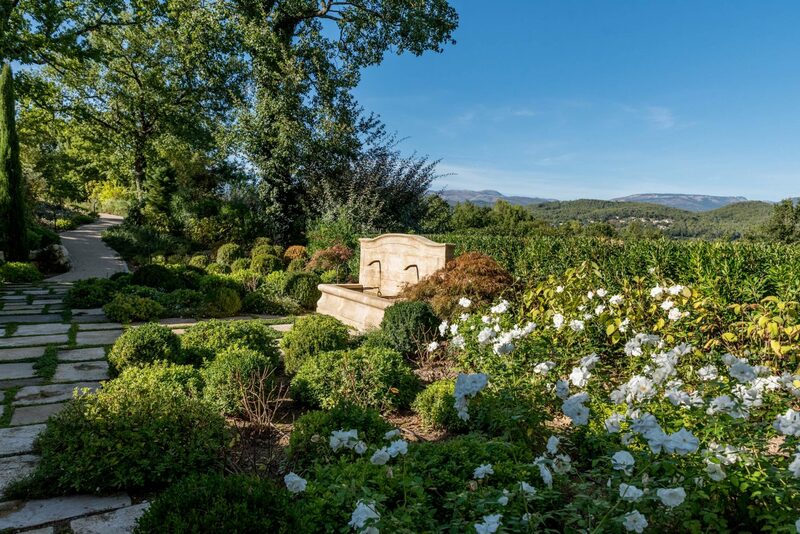 Head to the home of the Whispering Angel at the Chateau d’Esclans. 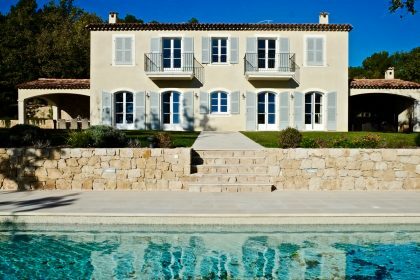 There is sailing on the coast, climbing or gliding as well as a fabulous choice of local beaches in Saint Tropez or Cannes. 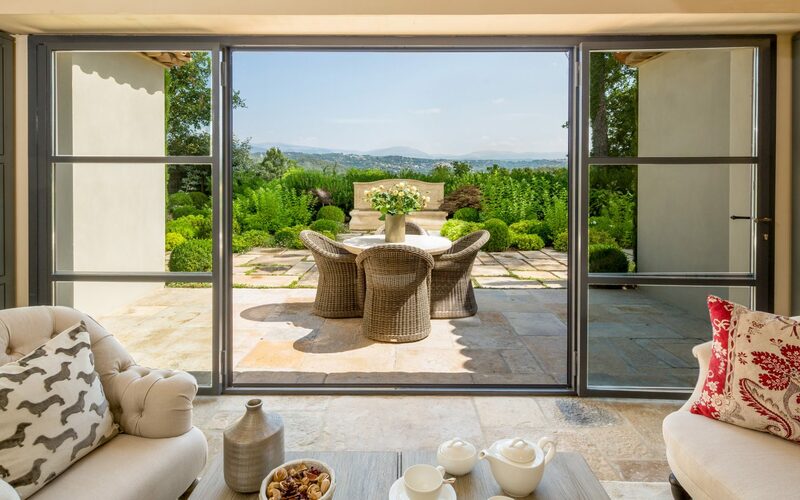 If you’re a golfer you will be in seventh HEAVEN as this house is set with a golf course as a back drop. 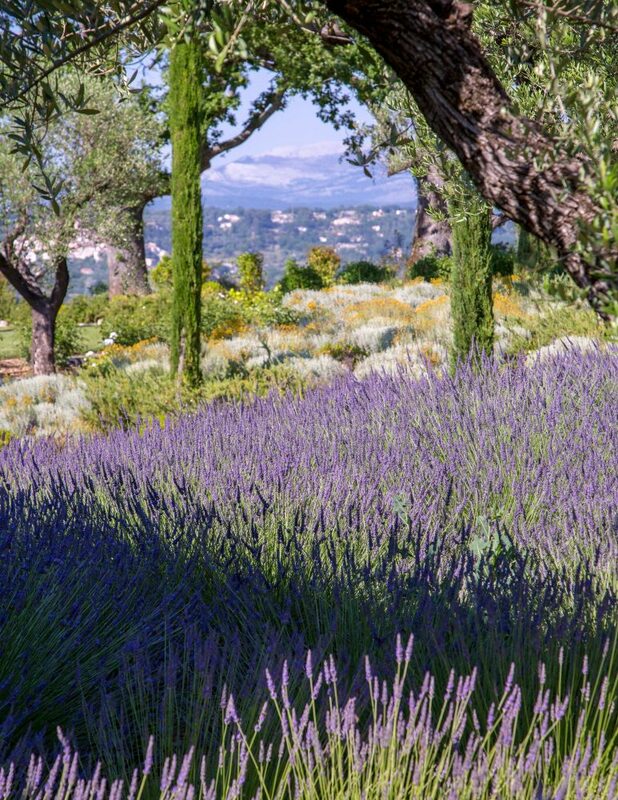 But if it’s not your thing you’ll hardly notice its there. 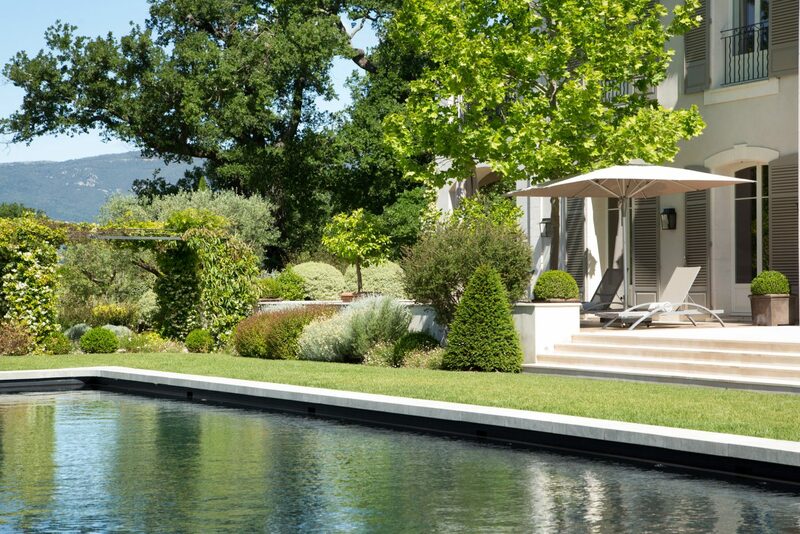 All in all the position of this house is perfect. 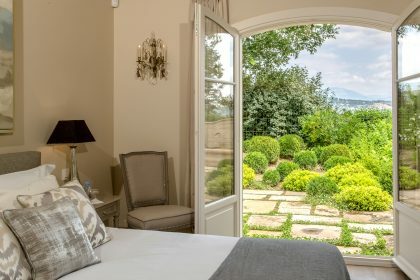 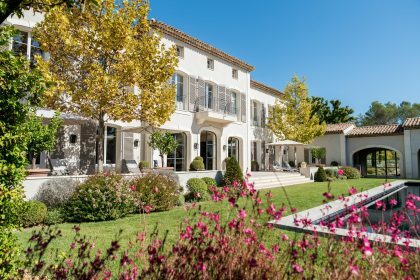 The south of France is full of dreamy pads but we really do think we’ve found one of the very best. 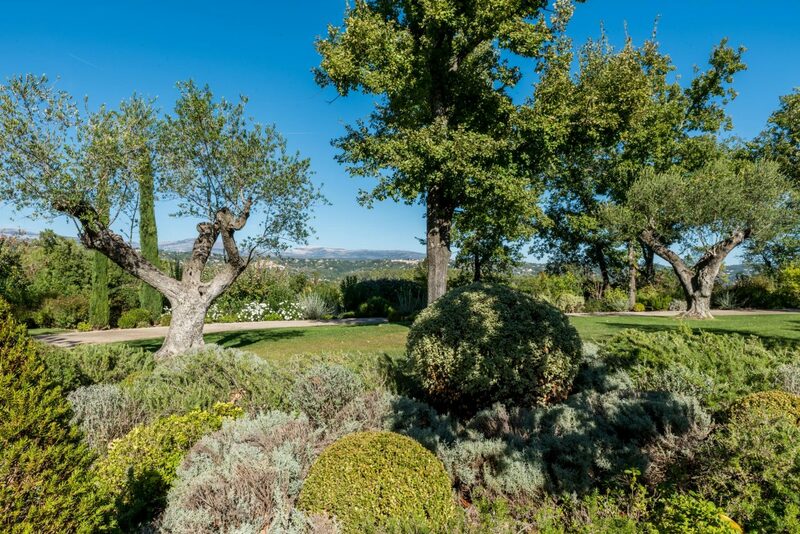 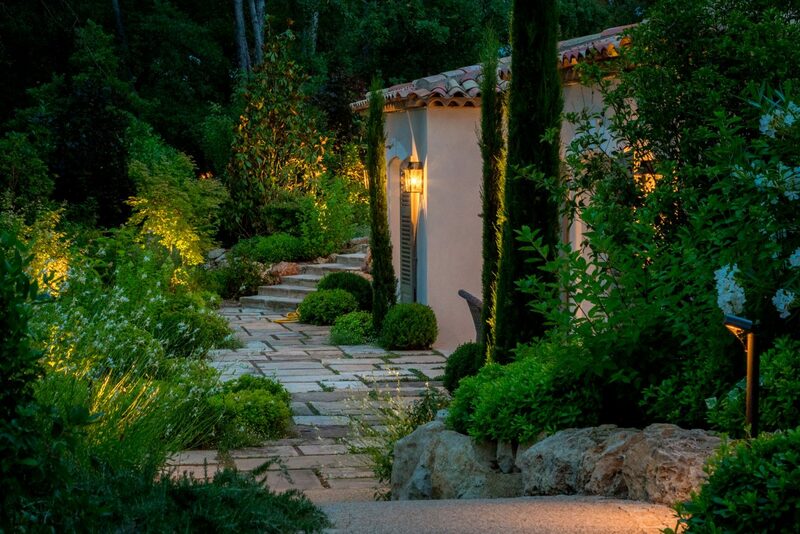 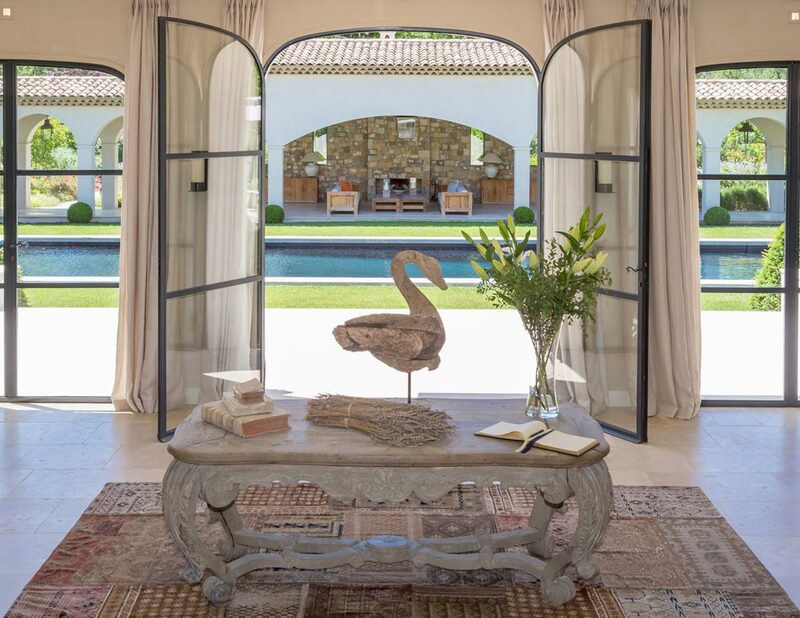 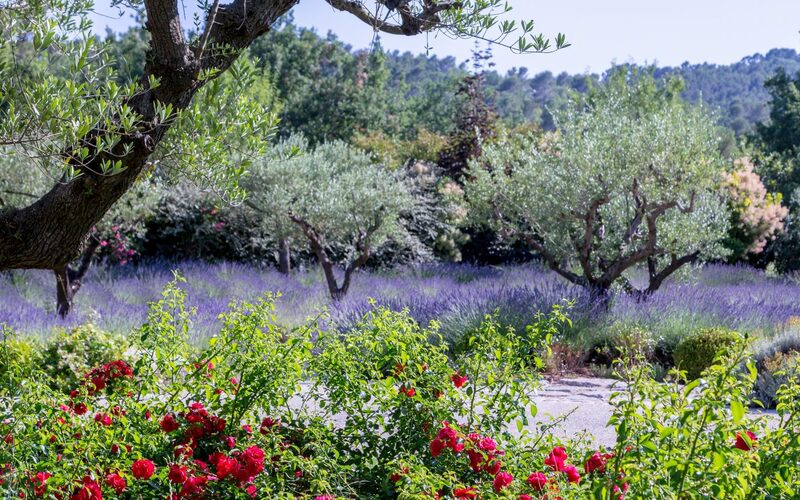 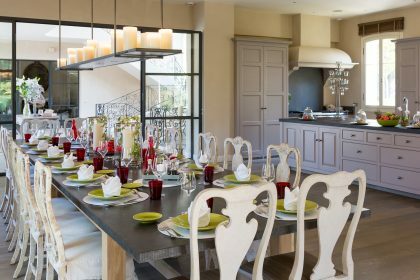 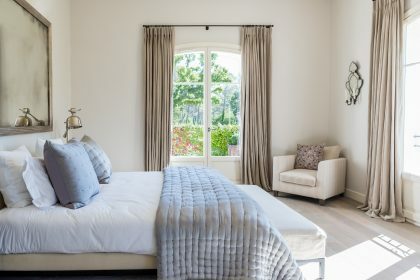 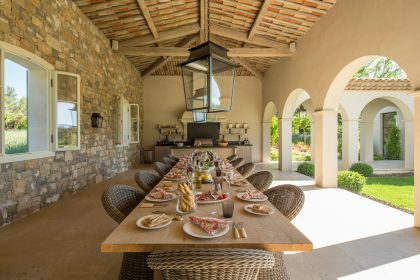 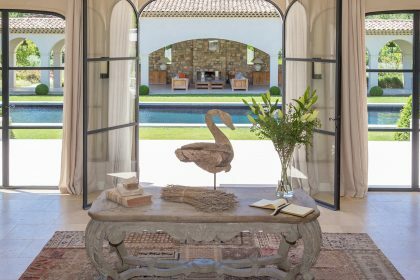 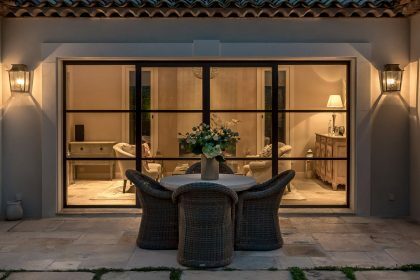 Set in sprawling gardens and built using only the very best quality materials, this villa is set in an impressive 1.4 ha of gardens around 30 minutes from Cannes. 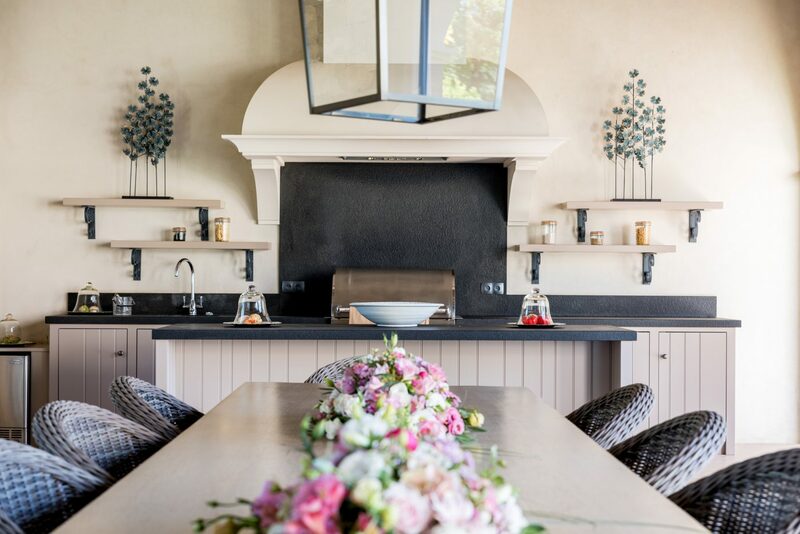 We spent a very spoiling two nights at the house and really know that you’re going to love it. 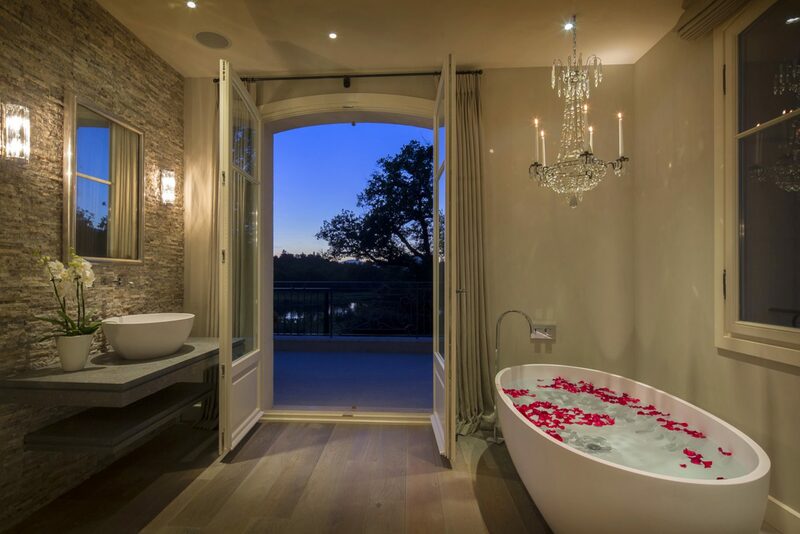 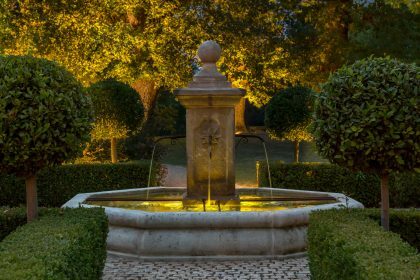 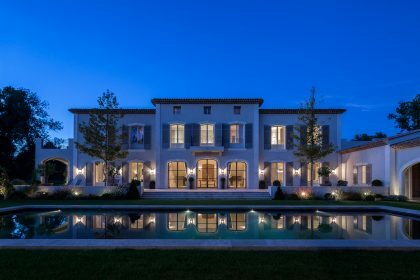 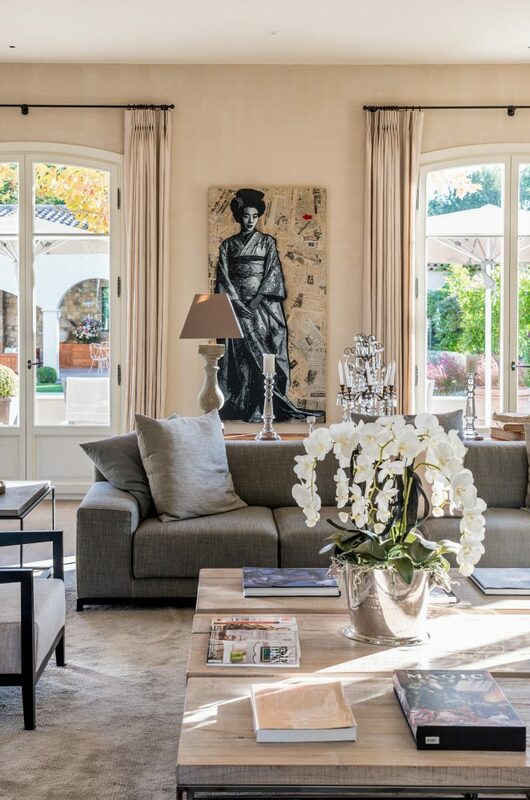 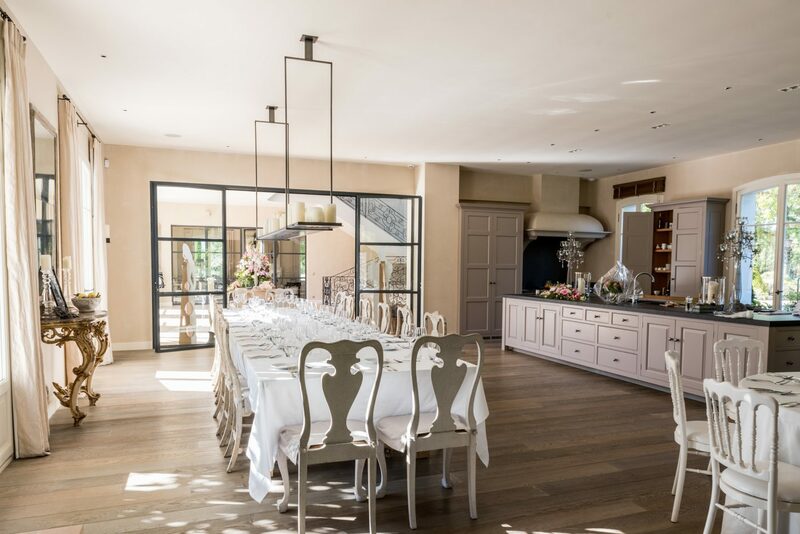 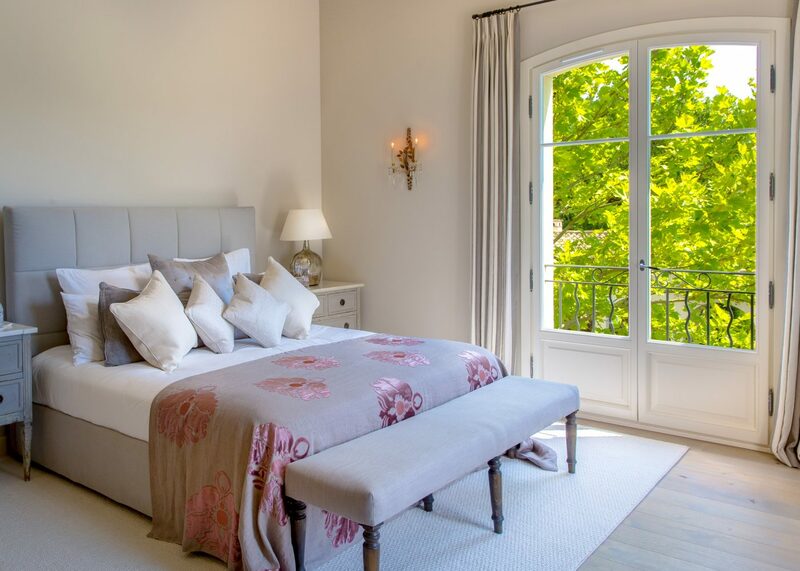 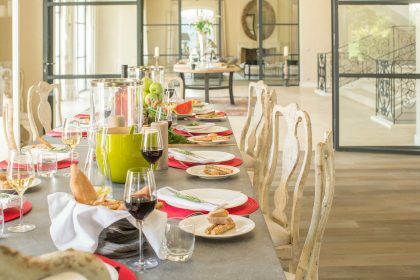 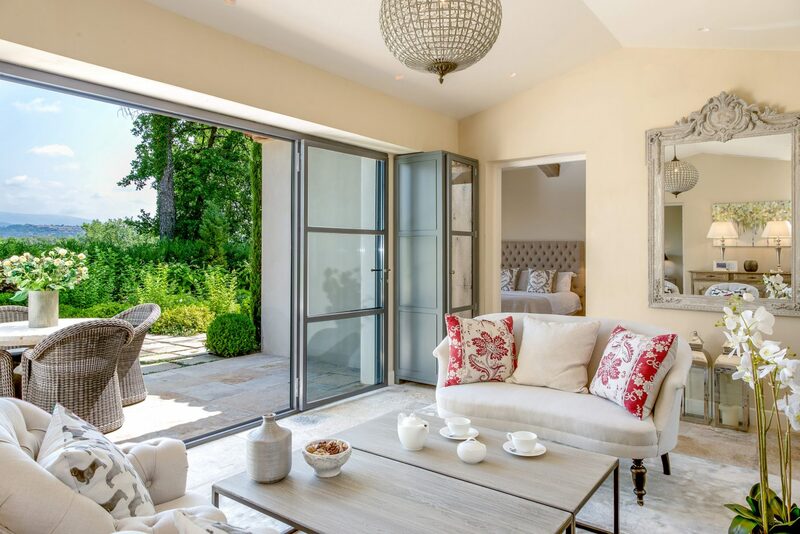 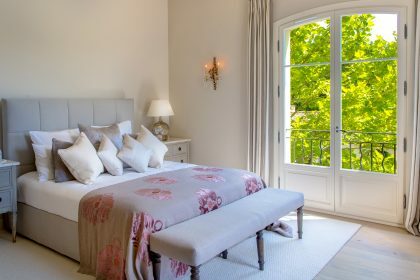 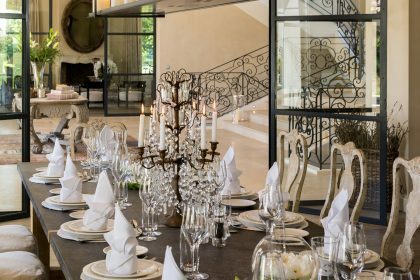 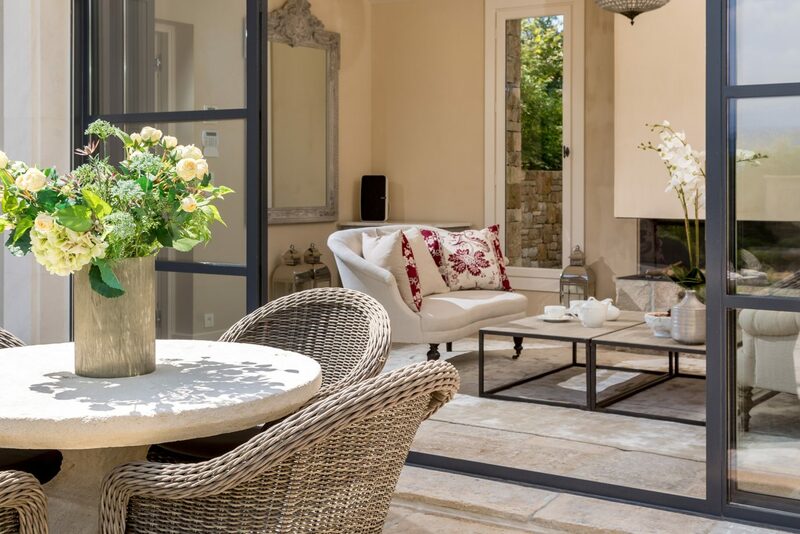 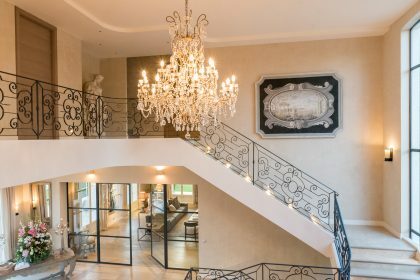 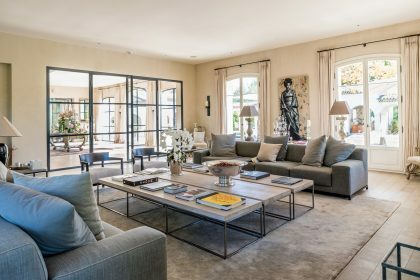 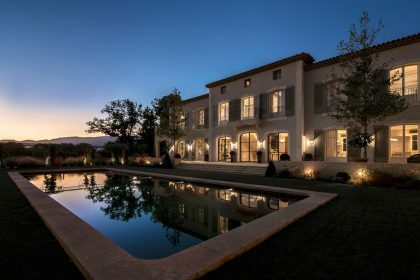 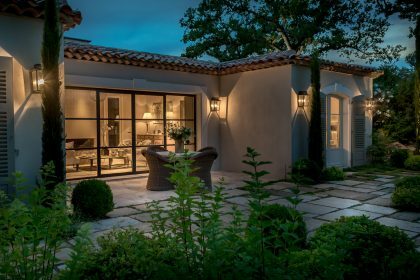 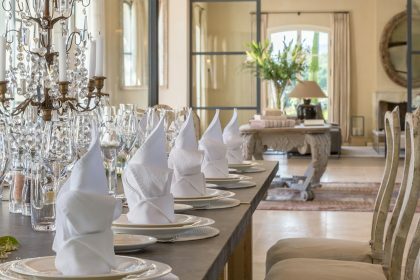 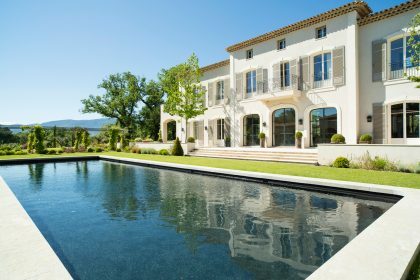 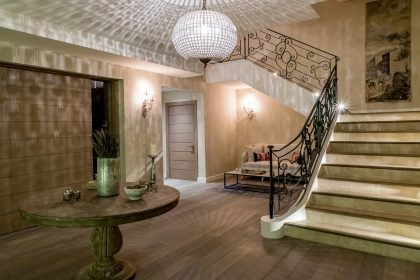 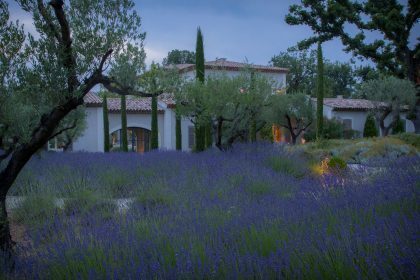 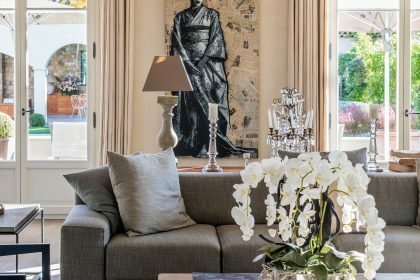 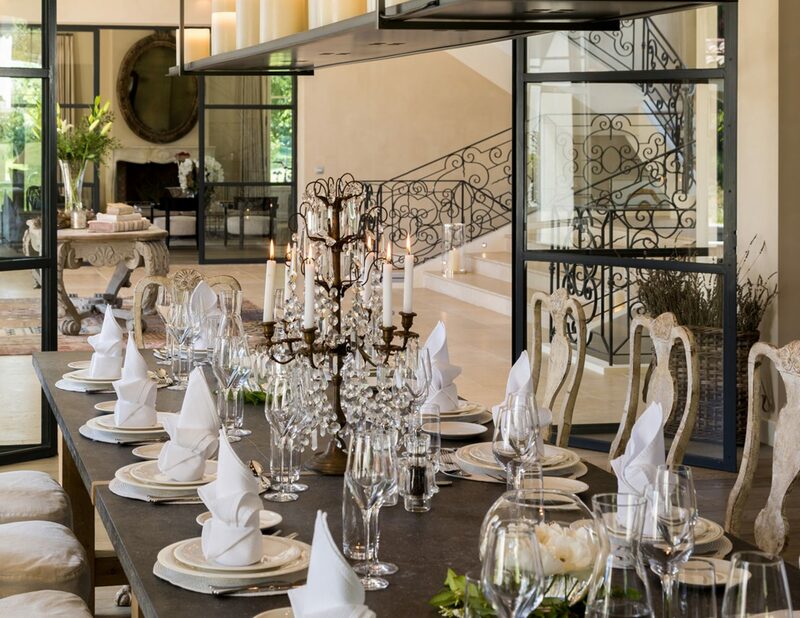 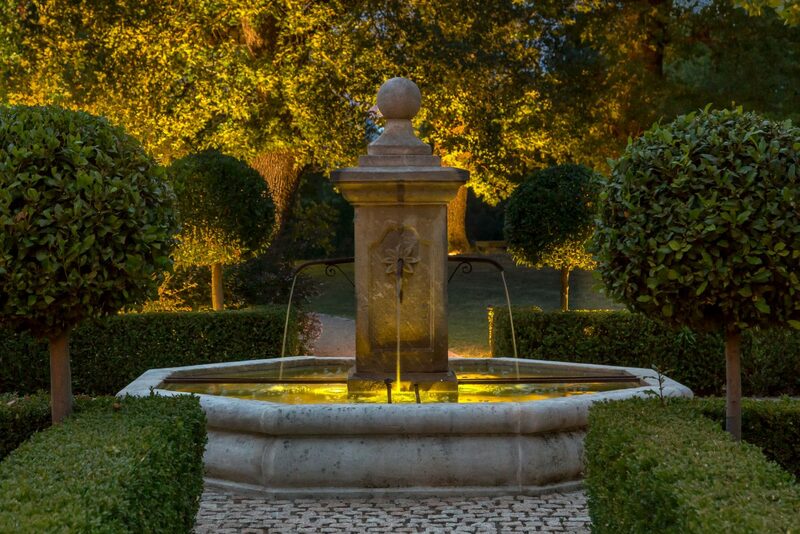 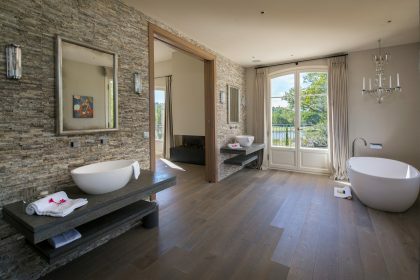 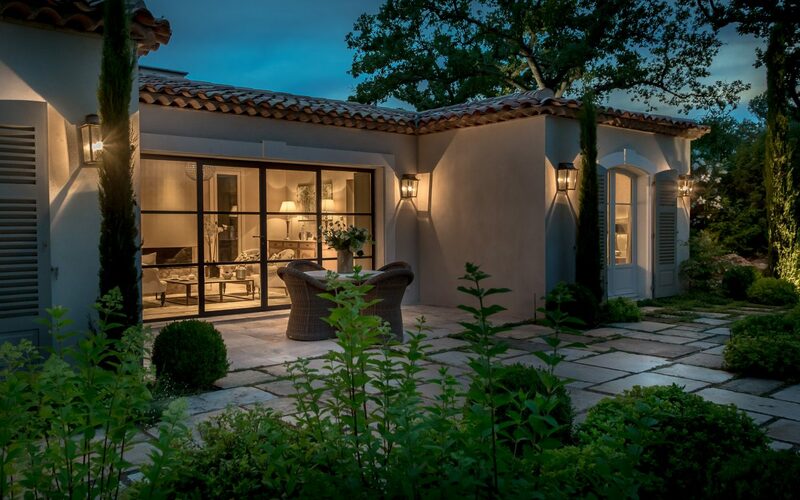 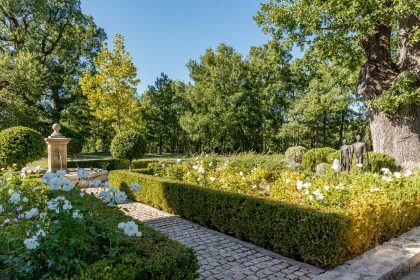 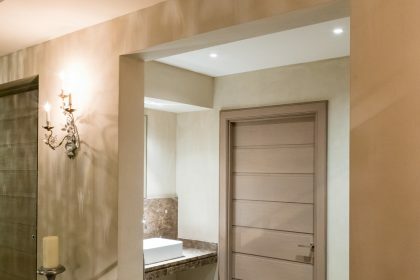 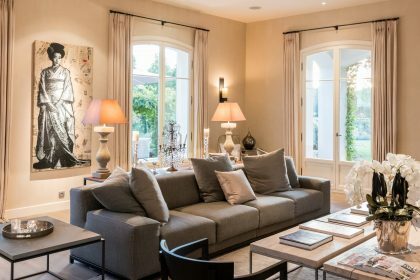 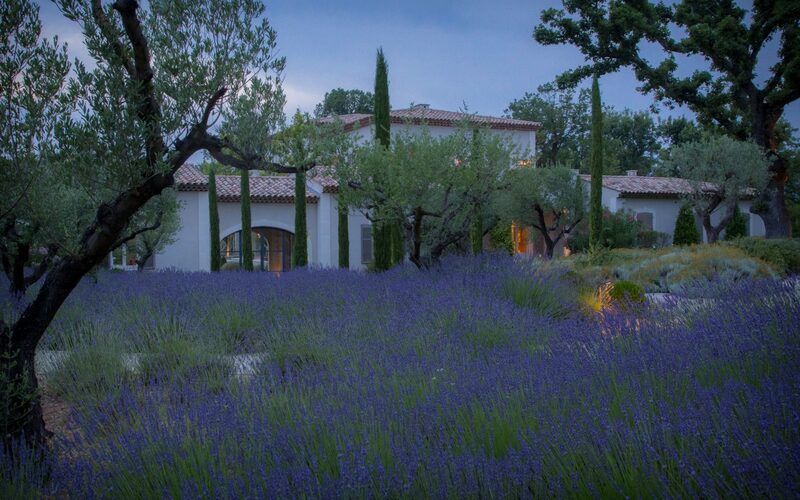 The house and grounds are imposing and beautifully finished in the magnificent setting within the exclusive golf resort of Terre Blanche. 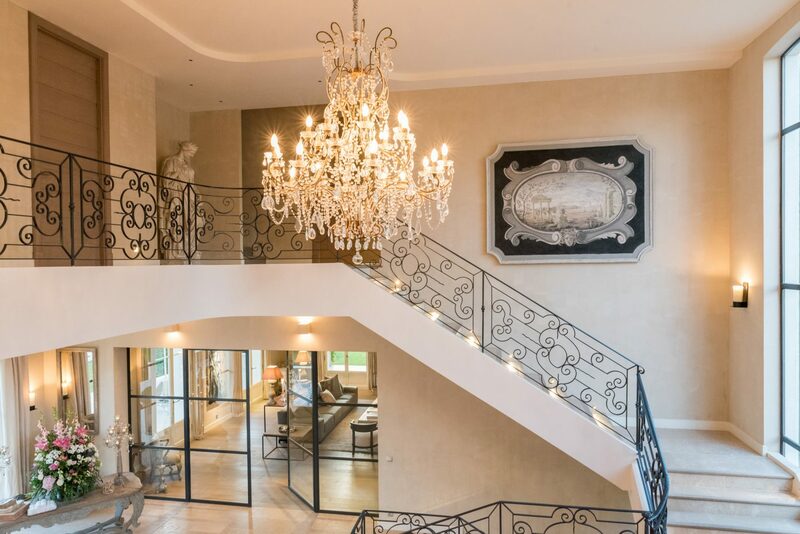 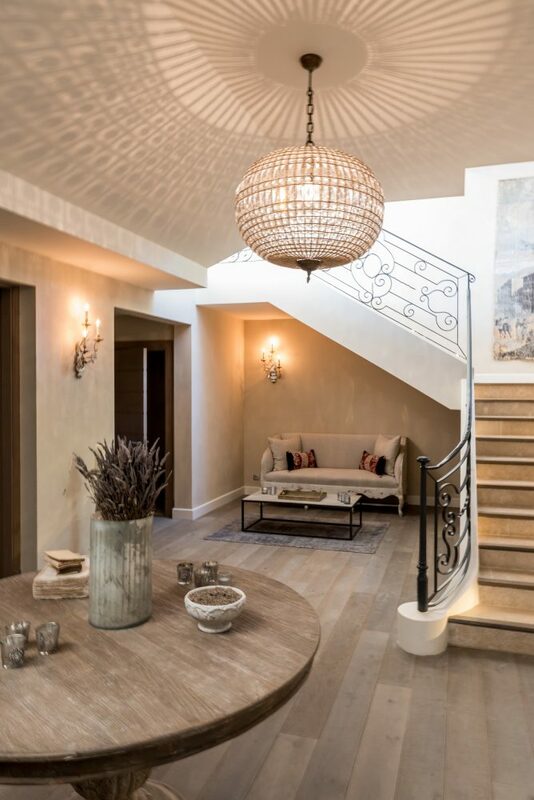 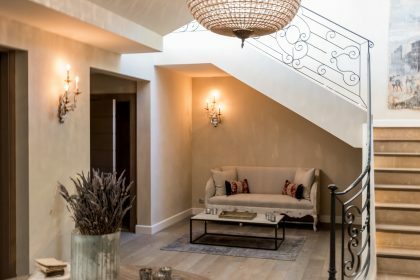 Entering into the house you find yourself in a double height hallway off which is the impressive staircase which leads up on both walls to the beautiful bedrooms. 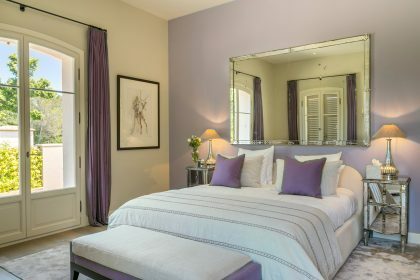 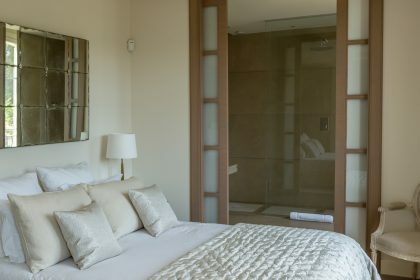 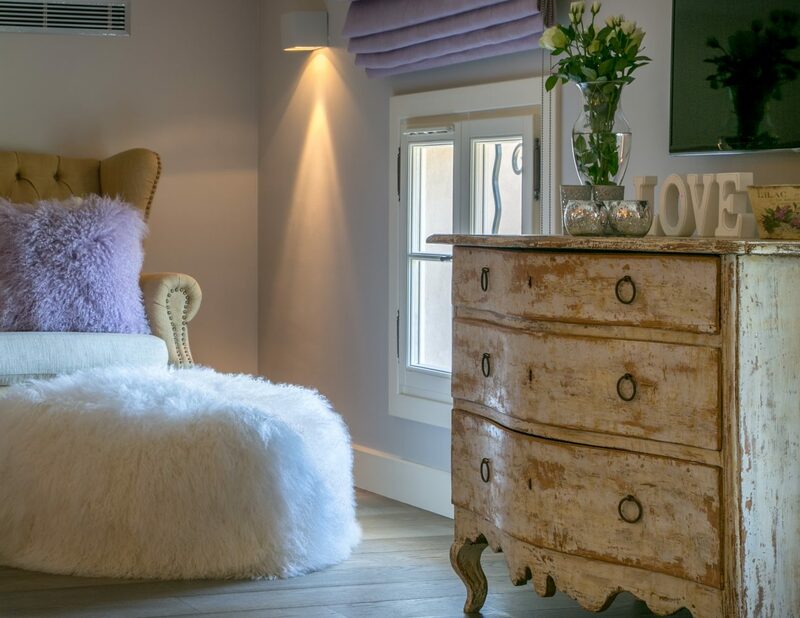 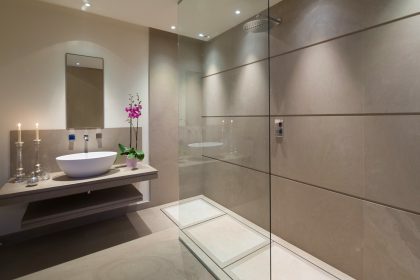 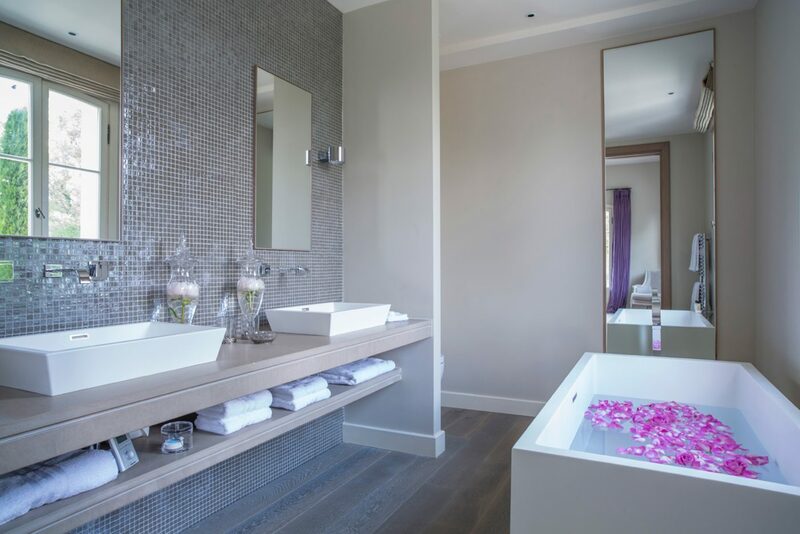 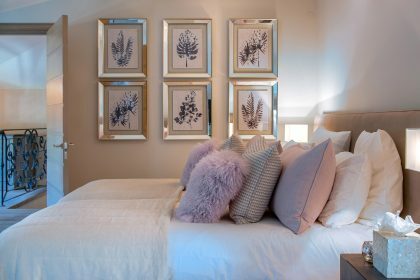 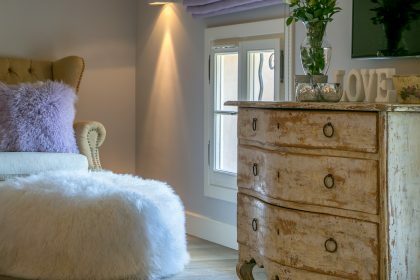 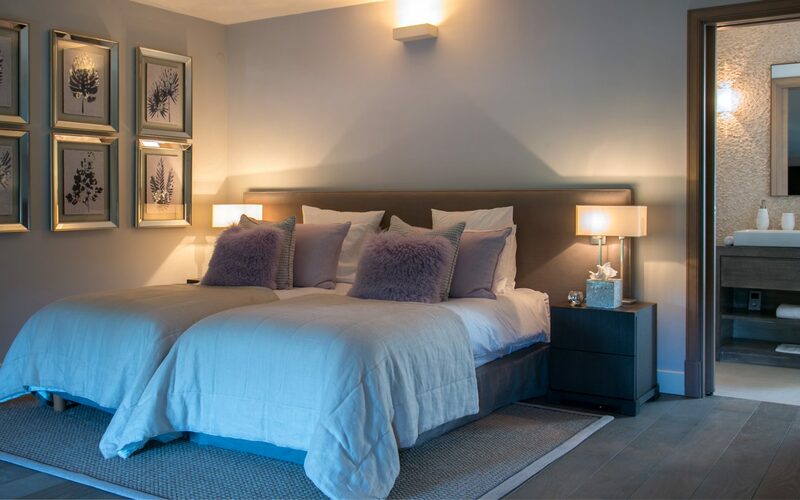 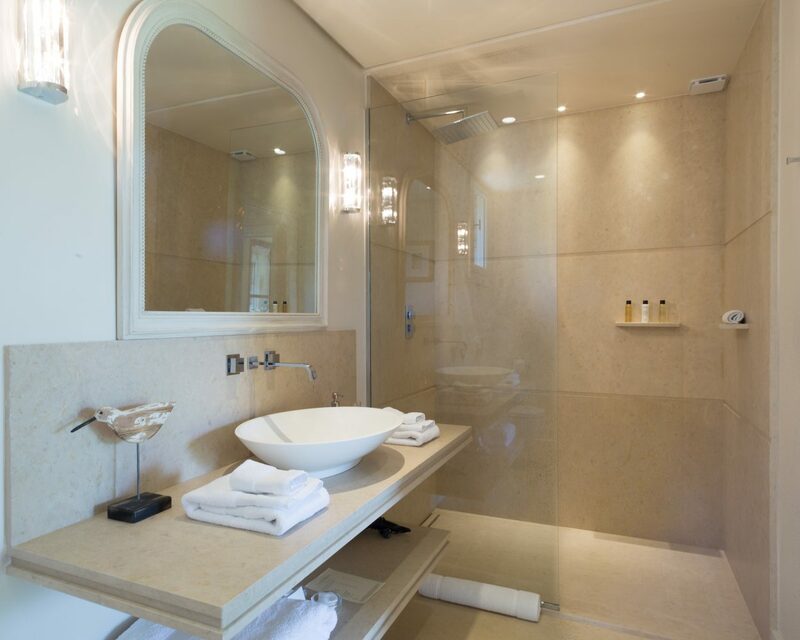 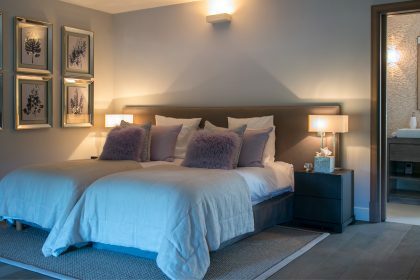 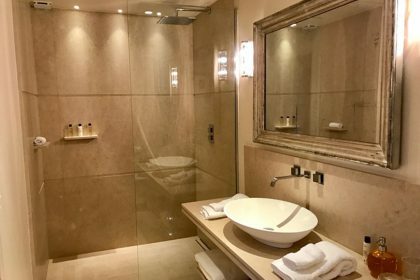 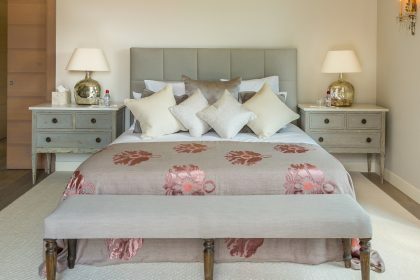 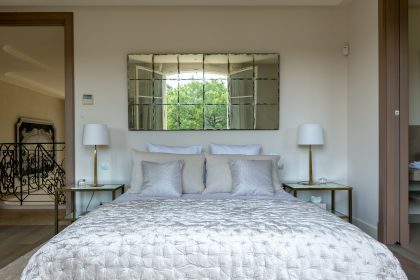 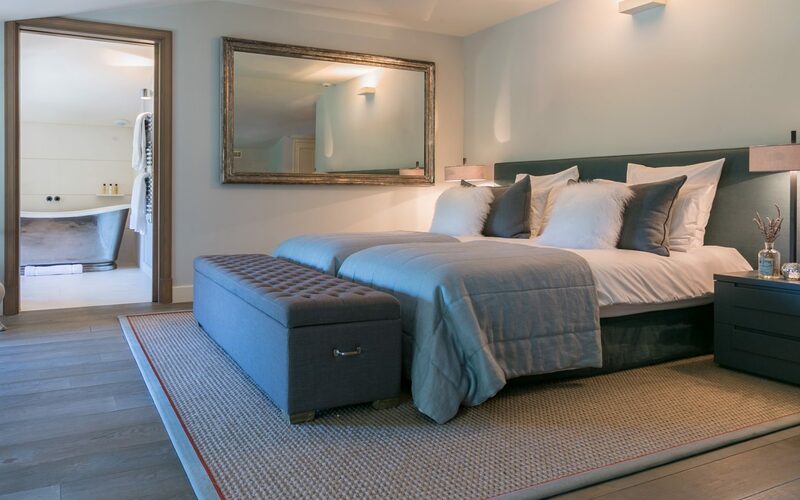 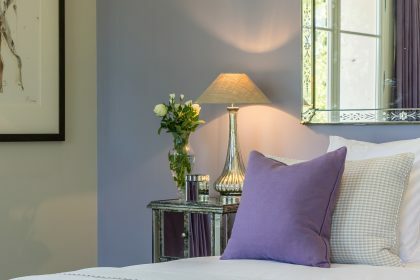 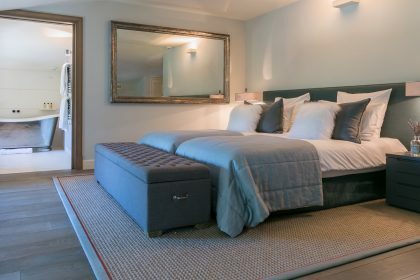 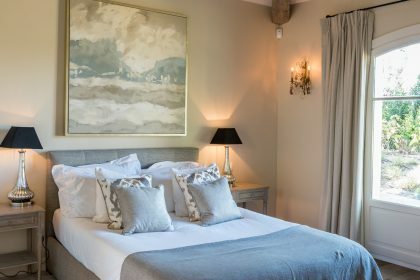 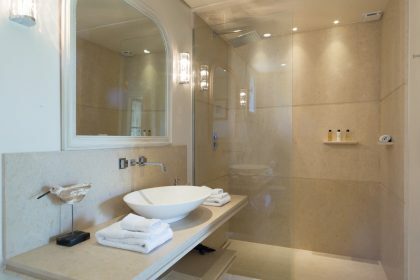 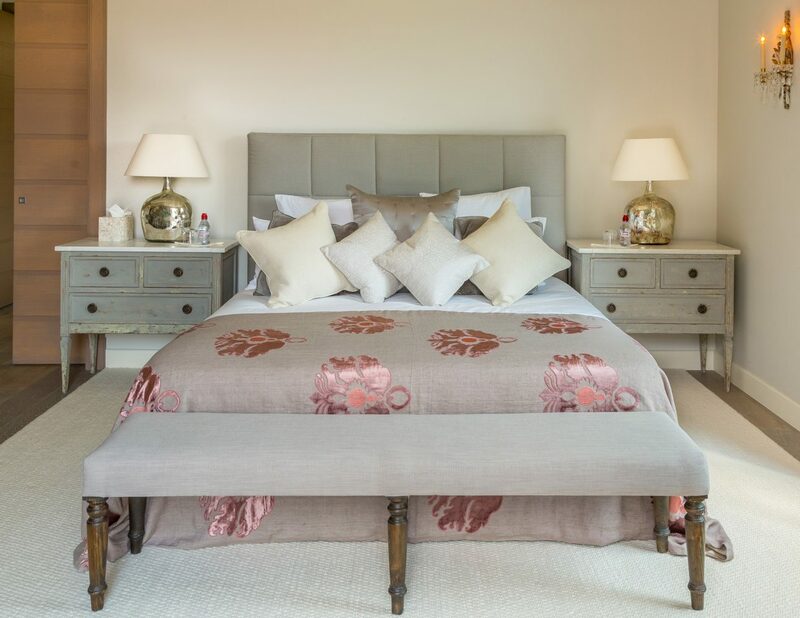 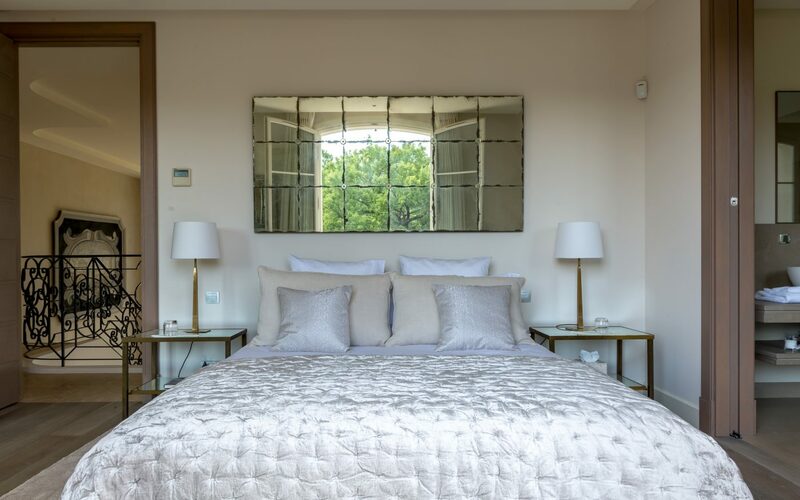 All the bedrooms have en suite facilities, fluffy towels and sumptuous beds and bed linen. 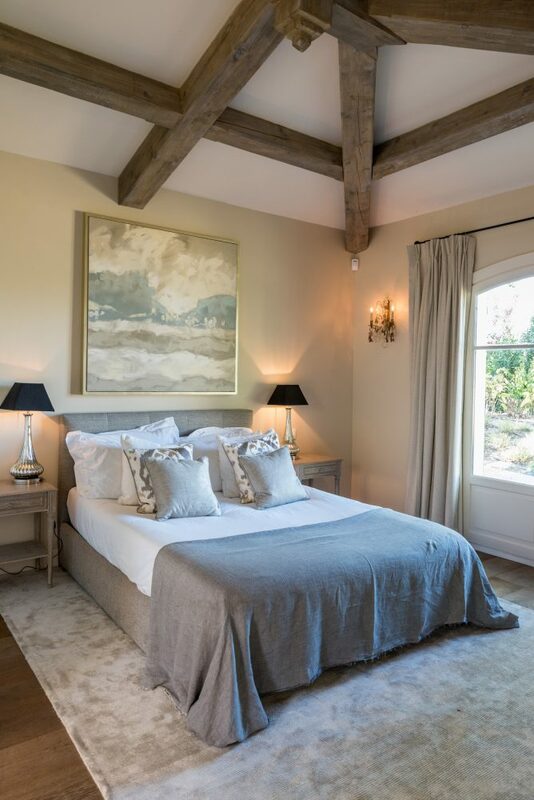 There is beautiful artwork on the walls, glass chandeliers, tasteful painted furniture as well as grand antiques. 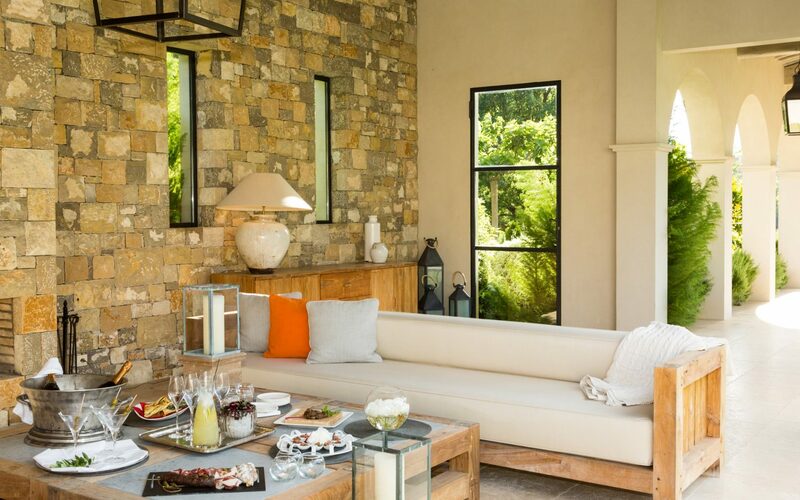 All sitting side by side and blending perfectly. 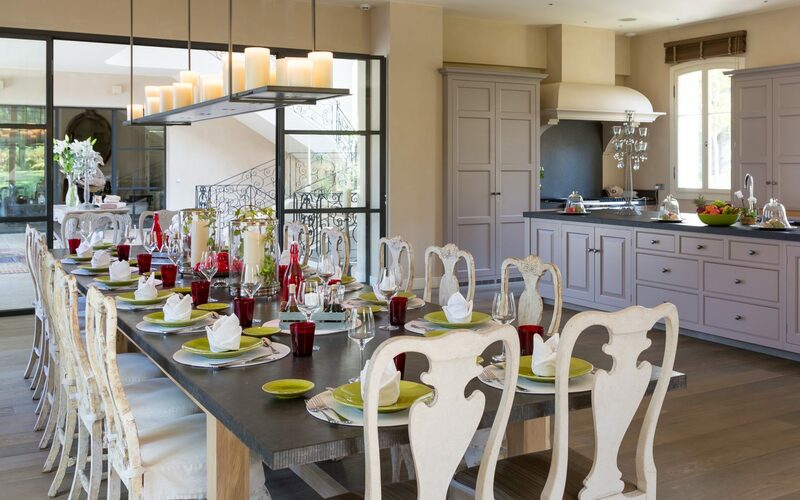 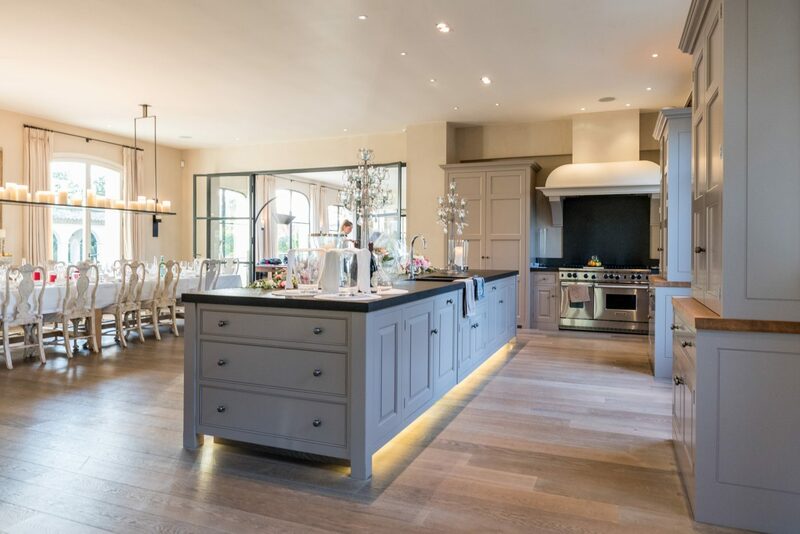 The state of the art kitchen has been painted in a restful grey with a large table nearby, perfect for coming together in the evening. Children will have a great time – there is so much for them to do from croquet, PlayStation, a cinema room, bicycles, endless games and even a dressing up box! 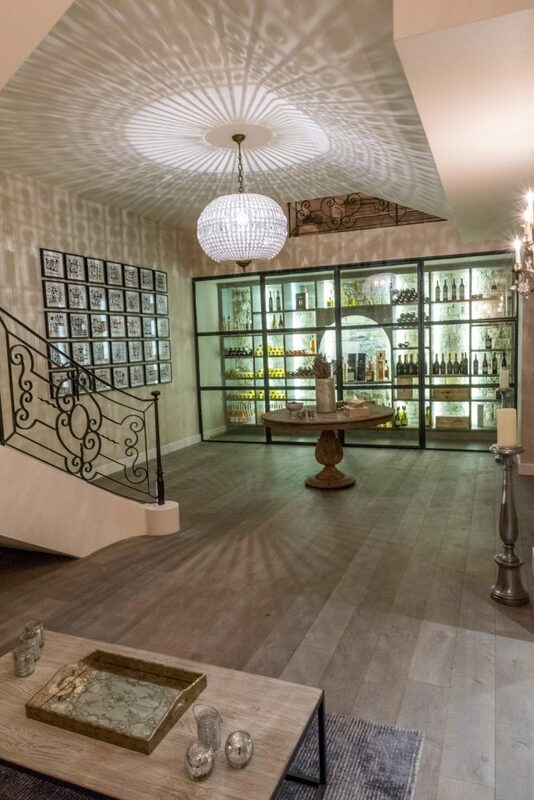 And for the adults there’s always the views, the golf and the wine cellar (among the most impressive we’ve seen). 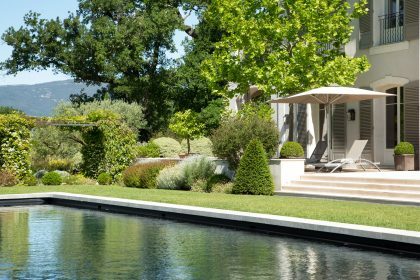 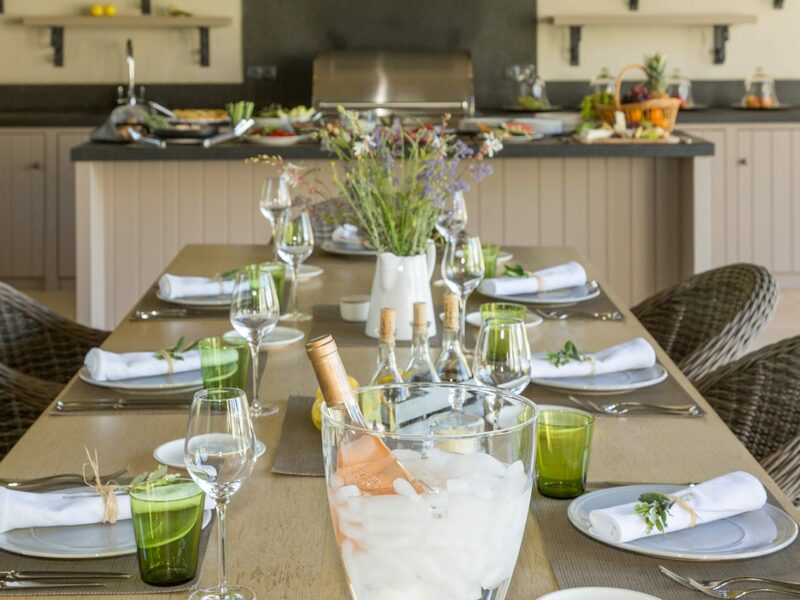 The swimming pool is the length of the house and positioned just off the main terrace, there are umpteen places to sit in the shade, vast living and dining areas mean the group can get away from each other if they need to before coming together to play croquet or badminton. 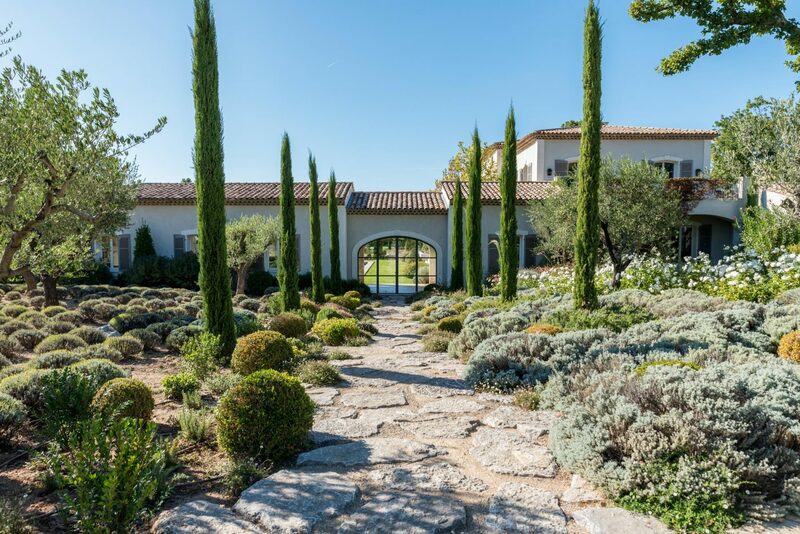 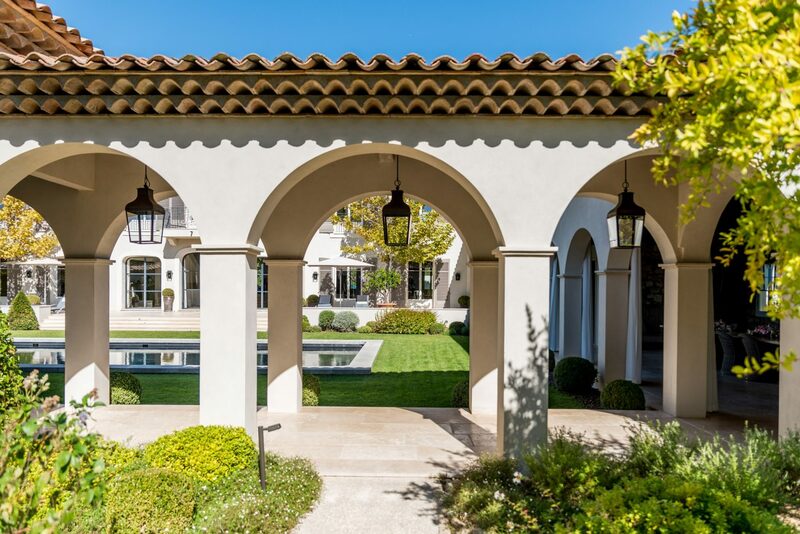 There are colonnaded arches with a walkway taking you away from the house and into the beautiful garden with its endless views, mature planting and stunning flowers. 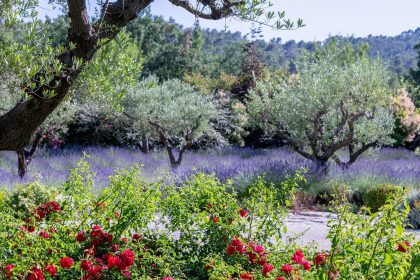 The local area is wonderful, teeming with markets selling the delicacies of the area there’s so much to do and see here. 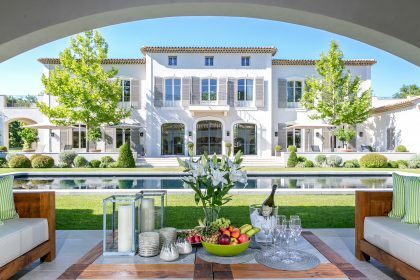 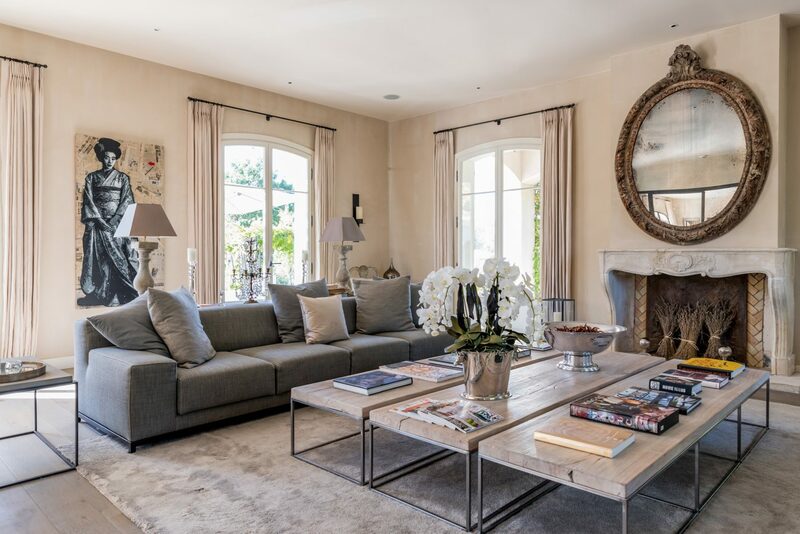 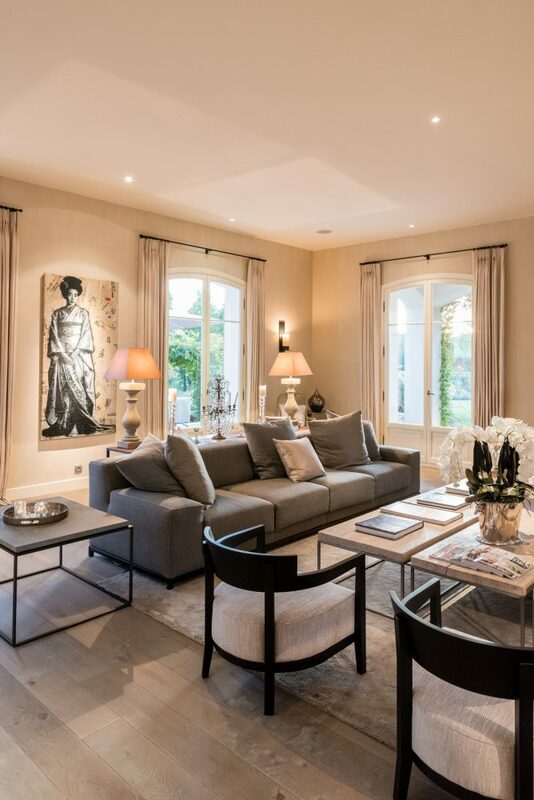 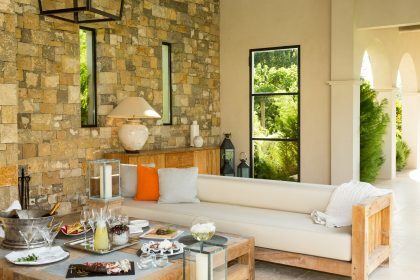 Sit back, relax and enjoy yourself in this extraordinary house, an extremely special, beautiful French villa that boasts the perfect location near both the Cote d’Azur and Provence with unobstructed views and total privacy.